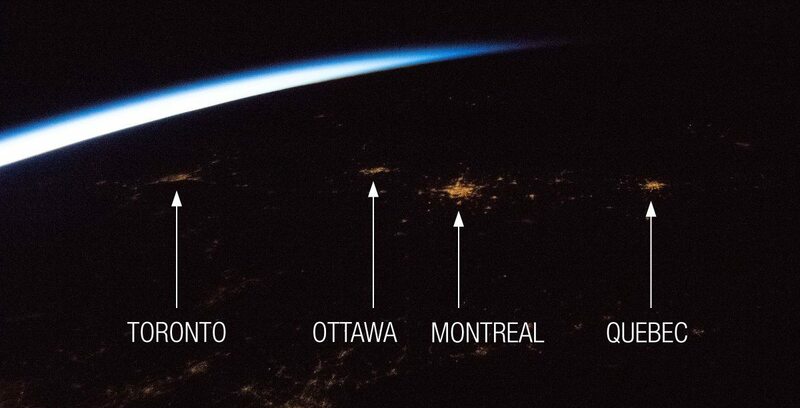 A photo posted to Twitter by Canadian astronaut David Saint-Jacques shows how close major cities on the east coast of Canada really are. In December, David Saint-Jacques became the ninth Canadian astronaut to be launched into space and the first since Chris Hadfield in 2013. Saint-Jacques, joined by crewmates Anne McClain of NASA and Oleg Kononenko of Roscosmos, the Russian space agency, will spend over six months aboard the orbiting space laboratory, supporting world-class science and time-critical operations. Along with operating the Canadarm2 and performing maintenance duties, the 48-year-old Quebec native snapped a gorgeous picture of the Toronto-Ottawa-Montreal-Quebec City corridor and shared it to social media, giving the virtual world a spectacular perspective of how close we really are from great heights. The distance between Toronto to Quebec City spans 798 km but from Saint-Jacques’ point of view, it looks mere inches apart. The picture was posted to the astronaut’s Twitter page which is full of details about the spaceman’s journey and Canadian Space Agency updates.